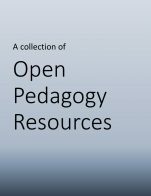 The "OER Toolkit for Trades Instructors: Adopting an Open Education Resource & Integrating it into a Trades Course" illustrates a snapshot of the OER adoption process. 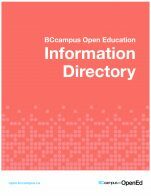 This Toolkit is designed to answer questions posed by BC Trades instructors specifically, but the steps described will also support similar projects in other disciplines and programs. 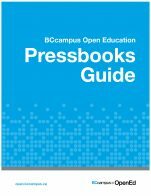 The Toolkit is presented in the form of a (possible) case study, which is based on questions and issues shared by Trades instructors from three BC post-secondary institutions: Camosun College, Kwantlen Polytechnic University, and University of the Fraser Valley. 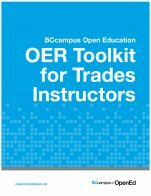 OER Toolkit for Trades Instructors includes a quick reference guide of definitions, summary of a sample course, a step-by-step guide to implementing course revisions and OER adoption, links to external resources, a sample module and a range of best practice examples. 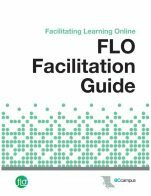 Following three phases of an adoption process (Phase – Take stock; Phase 2 – Make a plan; Phase 3 – Adopt and evaluate), the Toolkit also explores the motivation of the user and why instructors adopt OERs. OER Toolkit for Trades Instructors by Sue Doner, Susan Chandler, Rod Lidstone, Josh Stull; Camosun College is licensed under a Creative Commons Attribution 4.0 International License, except where otherwise noted.